I could really do with a drumroll effect and a ta-da sound here. 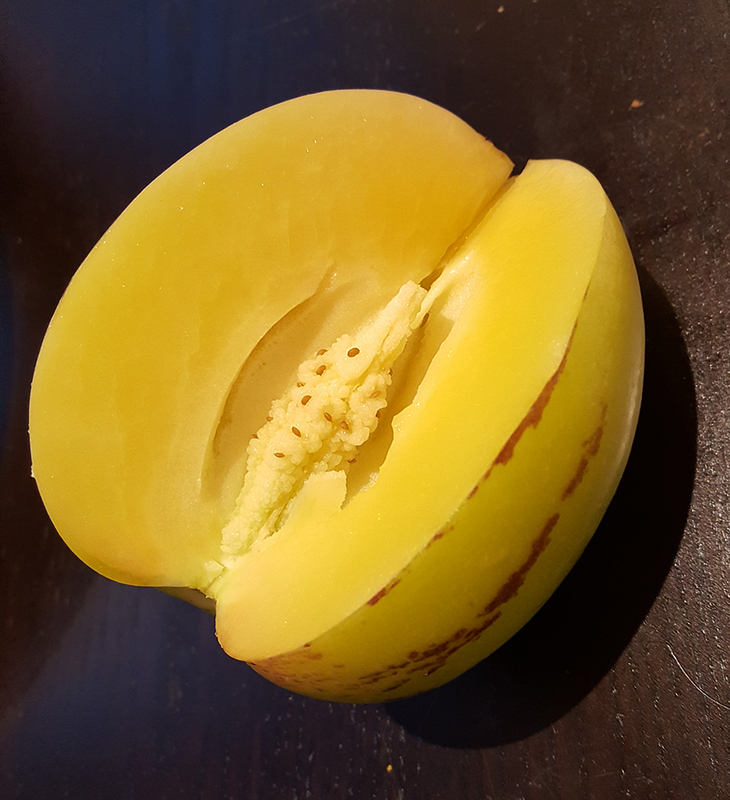 After three years of trying, I have a crop of these large, heavy, purple-striped melon pears, which go by the botanical name of Solanum muricatum. Actually I dislike calling them melon pears. As you can see from the botanical name, they are neither melons nor pears, and they taste nothing like pears at all. I first encountered them on a trip to South America: they are a fruit commonly found in shops and on cafe menus in Chile. There they go under the name pepinos dulces, or sweet cucumber (and no, they're not actually cucumbers either). The green fruit, which are the size of a teardrop-shaped grapefruit, are ripe when they develop the purple striping and there is a little - but not much - give when you squeeze them. Inside is all flesh with a thin fibrous core. The taste is generally referred to as a meeting between melon and cucumber, hence the popular monickers for them. This means they are equally happy in a vegetable salad - a simple dressing of white wine vinegar and olive oil, salt and pepper, brings out the sweetness beautifully - or a fruit salad. Substitute for melon and it goes brilliantly with ginger and/or cured meats. The seeds germinate easily enough, but previously I tried to grow them either outside, and then when that didn't work, in a soft plastic patio greenhouse. This year, I've had my first season with a 'proper' greenhouse and it has made all the difference as far as the sweet cucumber is concerned. They need a long season in the UK: sow in February in a heated propagator, and, if your greenhouse is unheated, keep them indoors until the nights are no longer chilly, so around May, then transfer to a sunny greenhouse and water regularly. The plants are inclined to trail once they are established, and my greenhouse really doesn't have room for trailing plants so I trained them roughly up bamboo canes. Around June/July, the plants should bloom with striking purple and white striped flowers. 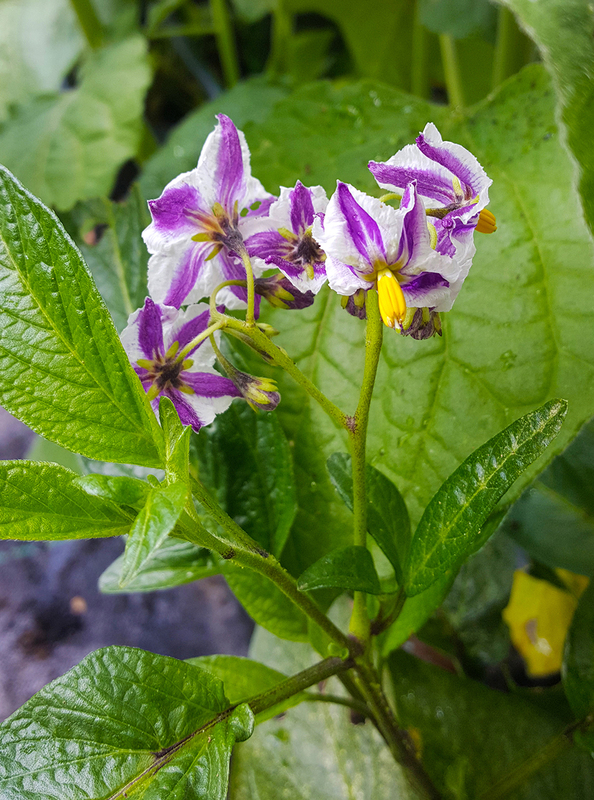 This is when you can really see that it is a Solanum: a pointed yellow pistil like a furled umbrella and petals folding back from the centre. The emerging fruit looks like a small green plum to start with, then a pale green aubergine. The distinctive purple markings don't develop until it ripens, which should be by September or October. 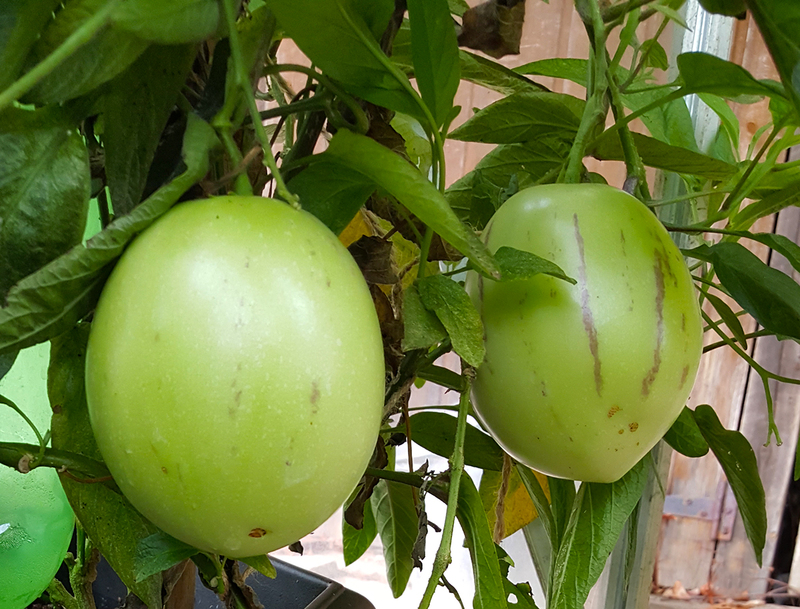 As I write this in mid-October, I can see two more small fruit developing on the plant, about the size of a hen's egg, but I strongly doubt there is enough time now for these to mature and ripen in the UK, even in the greenhouse. I want to try them! Greenhouse crop in the UK, I think. My previous attempts to produce edible fruit, either outside or in a soft plastic 'patio'greenhouse, came to nothing. I'll see if I can bring one over in a couple of weeks time.